A SHINY SNACKMOBILE. Smokestream gleams even on overcast days as it serves up tacos, hot dogs, and mac’n’cheese to hungry patrons. 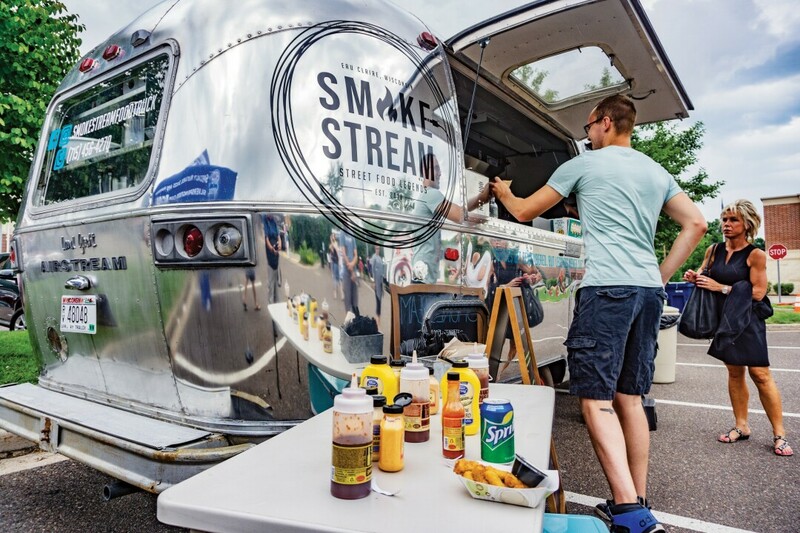 Housed in a renovated ‘71 Airstream, managed by Mark Schuh, SmokeStream Food Truck combines the classic intrigue of a food truck with the eclectic and eccentric menu that’s taking the Chippewa Valley’s tastebuds hostage. Its menu features street food classics with a music-themed twist, including Tupaco Tacos, the Snoop Dog, and Macklemore mac’n’cheese. The shiny chrome exterior of SmokeStream is quickly becoming a calling card and beacon for foodies far and wide. The truck’s smoker and charbroiler produce mouthwatering barbeque and good old comfort food to soothe the soul, calming those rumbling stomachs. “My idea was to offer a variety of food, be creative with the menu, incorporate music (my inspiration in the kitchen), keep it simple and have fun.” Schuh said. Smokestream’s grand debut made a splash on June 16 at Riverview Park during the air show. The food truck has since traveled across the city, providing lunches and dinners for the hungry masses. Schuh was initially inspired by the food truck craze taking over the Twin Cities. Minneapolis in particular was hit hard with the food truck virus. The movie Chef, starring Jon Favreau, was also a major inspiration for Schuh, but unfortunately Eau Claire wasn’t ready for food trucks at that time. Flash forward 4 years and now food trucks are quickly becoming the norm in the Chippewa Valley. Smokestream’s menu is highly influenced by Schuh’s love for music and desire to give the people of Eau Claire multiple food options to choose from. The current menu, showcasing the an assortment of Street Food Legends, is just a slice of what Schuh has cooking. Different food options will be in the rotation in the future, so all of you food aficionados should keep an eye out for more dishes that will rock your world. Smokestream’s Facebook and Instagram pages are hubs for the food truck’s movements, current menu, and announcements, as well as a place to leave those gleaming reviews to match the Airstream’s finish.